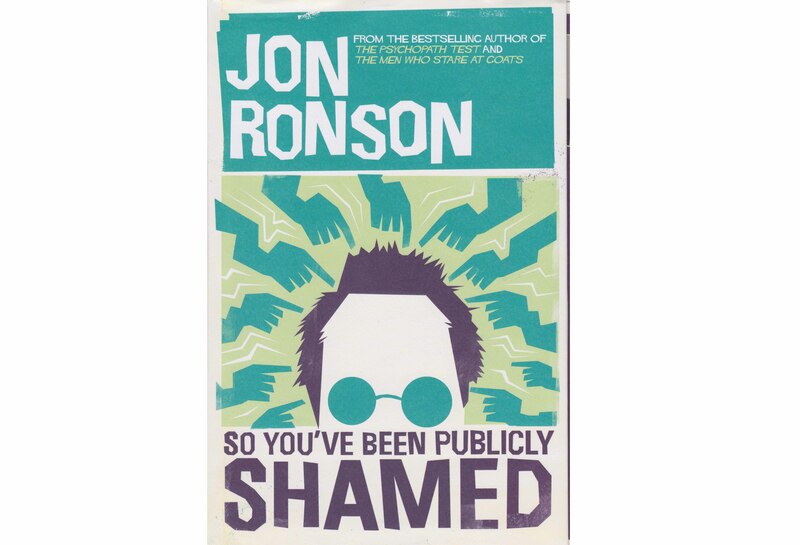 Our editor Jon Sutton reviews Jon Ronson's new book, 'So You've Been Publicly Shamed'. Throughout his career as a journalist and author, Jon Ronson has excelled in tales of everyday craziness. The ideas themselves are often fairly mundane: delving into conspiracy theories, investigating whether psychopaths walk among us, exploring what’s it like being in an oddball band. ‘So you’ve been publicly shamed’ is, hands down, his most cutting edge idea for a book yet. Referring mostly to social media, he writes: ‘A great renaissance of public shaming is sweeping our land. Justice has been democratized. The silent majority are getting a voice. But what are we doing with our voice? We are mercilessly finding people’s faults. We are defining the boundaries of normality by ruining the lives of those outside it. We are using shame as a form of social control.’ I have seen this story play out. Ronson has my attention. That's partly because it’s a story that involves psychology, psychologists, and even the British Psychological Society. In a skilful hat-trick of opening chapters, Ronson considers the fall from grace of science writer Jonah Lehrer, exposed as a plagiarist and inventor of Bob Dylan quotes. ‘Probably the worst infraction’, Ronson notes, ‘was that Jonah had taken some paragraphs from a blog written by Christian Jarrett of the British Psychological Society and passed them off as his own.’ Well, as Martha Graham used to say, ‘If you’re going to steal, steal from the best’. For the record, Lehrer personally apologised to Jarrett (editor of our Research Digest), and the apology was accepted. I think Ronson believes that he is doing something good. But he also seems well aware that his relationship with his subjects is changing. ‘The powerful, crazy, cruel people I usually write about tend to be in far-off places,’ he says. ‘The powerful, crazy, cruel people were now us.’ Is Ronson aware of the power he has not just as an online shamer, but as a writer of this type? He quotes another successful science writer, Malcolm Gladwell: ‘I was so enamoured by the metaphorical simplicity of that idea that I overstated its importance.’ I think Ronson knows that he, like all journalists, hates to let the truth get in the way of a good story. To be fair, it could be argued that Ronson tacitly acknowledges this danger; even that he is actively inviting opprobrium. Look at the cover: brand Ronson, identifiable now simply by a caricature of spiky hair and round glasses, surrounded by numerous pointing fingers. ‘So you’ve been publicly shamed’ – Ronson is almost calling on us to have a pop at him personally. And there are good grounds to do so. Ronson repeatedly admits that his interviewees were often reluctant to talk to him, and sometimes ‘expressed misgivings’ about their quotes being used in the book. Adria Richards, one of the ‘shamers’ included, is not best pleased with her treatment by Ronson. And some of the academic interviewees for a previous book, The Psychopath Test, were ‘taken aback to find that the book contained “liberal” and/or fictional accounts of their interactions with him'. Why is this any less of a journalistic crime than those Lehrer committed? Yet Ronson escapes scot free, and in fact says Lehrer ‘represented literary fraud in the pop science world. He made a fortune corrupting an already self-indulgent, bloated genre.’ For me, that got the biggest laugh of the book (although the joke about confirmation bias is a cracker). In his previous book, Frank, Ronson writes that journalists take ‘the furthest reaches of their interviewees’ personalities, stitch them together, deleting their ordinariness. We were defining people by their flaws.’ I hope Ronson doesn’t become defined by his own, because he’s an extraordinary storyteller when it comes to ordinariness. - 'So You've Been Publicly Shamed' is published by Picador, priced £16.99. Reviewed by Dr Jon Sutton, Managing Editor of The Psychologist.